The organizers of a recent symposium on diversity challenges in science, technology, engineering and math outline approaches to improve diversity and inclusion across all career stages. By Ian Haydon, Karla-Luise Herpoldt, Parisa Hosseinzadeh, Christine Kang, Lauren J. Kang, Nicholas P. Montoni and Wesley K. Tatum. 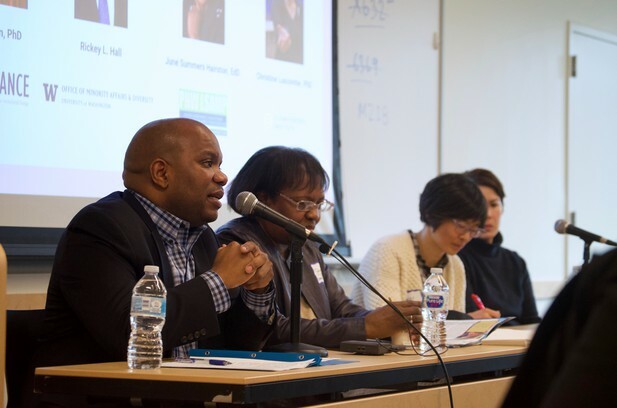 The Institutional Panel at the Strategies for Cultivating Inclusion in STEM symposium held at the University of Washington (UW) in February 2018. Left to right: Rickey Hall, Vice President for Minority Affairs and Diversity & Chief Diversity Officer at UW; June Summers Hairston, Director of the Pacific Northwest Louis Stokes Alliance for Minority Participation (PNW LSAMP) in STEM; Joyce Yen, Director of the ADVANCE Center for Institutional Change at UW; and Christine Luscombe, Robert J. Campbell Professor of Materials Science and Engineering and Molecular Engineering and Sciences at UW. Image credit: Parisa Hosseinzadeh. Unlike natural ecosystems, institutions are built. And the decisions that are made in our institutions create the culture in which we work and study. In particular, choices that offset bias will encourage participation and improve performance – not only for women and underrepresented minorities, but for everyone. For example, increased workforce diversity leads to increased innovation. Despite this, nearly two-thirds of the professionals working in science, technology, engineering and math (STEM) in the US are white or asian males, a number which does not reflect either the population at large or those with science degrees. Make inclusion intentional. Traditional ‘passive’ recruiting typically results in less diverse applicant pools. To counter this, the NIH is making it easier to hire diverse applicants by compiling pools of workers that better reflect the population at large, as opposed to the current STEM workforce. Resources like this enable employers to target underrepresented populations. Highlight diverse examples of excellence. The Meyerhoff Scholars Program at the University of Maryland Baltimore County recruits high-achieving underrepresented minority students to challenge biases faculty and peers may have. Instead of being seen as affirmative action choices, Meyerhoff Scholars excel in their classes. The effect of this type of recruiting is two-fold. Initially, it increases minority representation; ultimately, it creates a professional culture that values diversity. Recognize the power of potential. Picking top minority applicants isn’t enough to bridge the representation gap. A complementary approach is to give opportunities to students who struggle to access educational resources but have outperformed their circumstances. The pharmaceutical giant Novartis does this through its Postbaccalaureate Scholars Program, which provides students from historically underserved communities with opportunities to gain research experience. The program seeks to reduce the opportunity gap by preparing students with both the technical skills needed to succeed in the scientific workforce as well as the growth mindset and mental resilience that are essential elements in any high-impact career. Navigate implicit bias. Does implicit bias recognition training work? Anthony Greenwald, a psychology professor at UW and co-creator of the Implicit Association Test stresses that one’s own social and cultural experiences do not evaporate in a single training session: “In most cases, implicit bias is insidious; it’s small but accumulates over time”. The prevailing training method remains teaching people to “just stop [doing] it”, but in many cases individuals are unaware of what specific behaviors need to stop. In contrast, documenting symptoms and collecting data are a common practice used by many professionals to fix serious problems, and the same approach should be used more broadly to diagnose and resolve unconscious bias. In scenarios where unintended discrimination is likely to occur, Greenwald emphasizes that “you can’t hit what you can’t see”. In parallel, whistle-blowing movements such as #MeToo can be powerful tools for change. Be an inclusive instructor. Active learning improves classroom outcomes, according to research by Ben Wiggins and Elaine Klein of the Department of Biology at UW. Perceptions play an outsized role in defining classroom hierarchies. Research indicates that male students are more likely than female students to have their academic performance overestimated by their male peers. This can affect inclusion by influencing student self-confidence and persistence in STEM. However, ‘active learning’ approaches that emphasize peer-to-peer discussion and require all students to participate equally during class time counteract these assumptions and improve both perception and performance for all students. Create a sense of community. Peer-to-peer cohorts offer space to problem-solve, network and vent. Building community is especially important for underrepresented STEM professionals who might not see themselves in the faces of their colleagues. Many degree-granting programs are now using the notion of community building to improve recruitment and retention. Similar efforts are needed for postdocs and faculty, who do not naturally fall into peer groups. One such program is the NSF ADVANCE program which has been working to improve career advancement for women faculty at over 100 US institutions. Fortify trainees. Imposter syndrome can be more intense and frequent in women and underrepresented minority students. While community building can help to quell some of these feelings, it is not a complete solution. Mentors can further mitigate imposter syndrome by sharing their own experiences, and equipping trainees with the skills to thrive in their current positions and the resilience to succeed in the next stages of their careers. Track progress. Longitudinal data is essential for identifying problems and understanding if the schemes implemented to address the problems have been effective. The act of collecting the data can also provide further support for diversity initiatives. As an example, the Novartis Postbaccalaureate Scholars Program regularly checks in on past participants as they proceed through their career. The effect of this is two-fold. First, it allows Novartis to quantitatively evaluate how effective their program is at increasing the number of underrepresented minorities who pursue STEM careers. Second, regular communication like this contributes to a culture of continued care and support, which is important for both recruiting and retaining diverse groups of people. Why doesn’t the STEM workforce resemble the population at large? Many point to a ‘leaky pipeline’ as the problem. Traditionally, the proposed solutions have been to increase the number of students in STEM and to push for unconscious bias training. However, data from the NIH reveal that although women now earn more than half of all biomedical science degrees, they still hold fewer than one in five full professorships. Despite reaching the end of the pipeline, other factors remain that prevent them staying in STEM. To retain underrepresented minority students in academic STEM careers, it is clear that more must be done than just increasing the number who enter STEM disciplines. Through continued sharing of best practices, incremental changes can lead to larger cultural shifts that create a more inclusive environment. But cultural change must no longer be the personal project of motivated individuals. Institutions must hire strong leaders in dedicated diversity roles. “Culture change is very hard and very slow,” says Joyce Yen, Director of the UW ADVANCE Center for Institutional Change. “But there are a lot of things we can do to build a different kind of culture”. The authors of this article are graduate students and postdoctoral researchers at the University of Washington who organized a day-long symposium to share data-driven strategies to address current diversity challenges in STEM. Slides and videos from the event can be found at https://www.ipd.uw.edu/2018/03/sci-stem-symposium-2018/. The event was supported by the Institute for Protein Design, the UW Office of Minority Affairs & Diversity, the UW Office of Postdoctoral Affairs, the UW Race and Equity Initiative, the UW Graduate and Professional Students Senate, the Clean Energy Institute, and Genewiz. We welcome comments, questions and feedback. Please annotate publicly on the article or contact us at hello [at] elifesciences [dot] org. Interested in finding out more about opportunities, events and issues that are important for early-career researchers? Sign up to the eLife Early-Career Community newsletter or follow @eLifeCommunity on Twitter.